Google’s Reader is now officially dead, but the company wants to make users’ transition to other content aggregators as painless as possible, partly by keeping their data available for the next couple weeks. Users have until 12 p.m. PT July 15 to download a copy of their Google Reader data via the Google Takeout data download service, the company said Tuesday in a final farewell blog post. After that time, all Reader subscription data, which includes lists of people followed, starred items and notes, will be systematically deleted from company servers. Google Reader bids its users goodbye. “All subscription data will be permanently, and irrevocably deleted,” Google said, adding that the company will not be able to recover any Google Reader subscription data for any user after July 15. Google, however, is also directing users to dozens of outside alternative products that can be used in lieu of Reader. The list, compiled by the site alternativeTo, includes Feedly, The Old Reader, NewsBlur, Reeder and Flipboard. 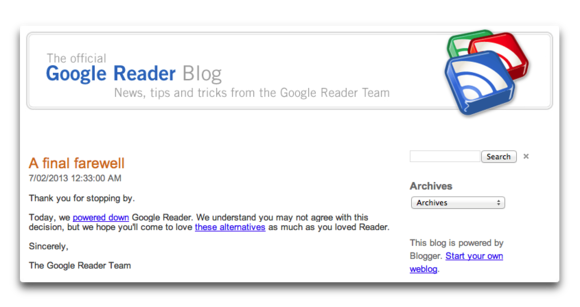 Google Reader was turned off around midnight on Tuesday, the company said. Google Reader’s closure was originally announced in March, along with the shutdown of several other products such as Google Cloud Connect and Google Building Maker. In the immediate aftermath, tens of thousands of devoted users took to the Internet to sign petitions on sites pleading for the service to be brought back. Since the announcement, a scrum of other Reader-like products have amped up their services and stepped up to the plate. Last month Feedly switched on its own RSS (Really Simple Syndication) service and Web-based app that can run inside any browser. NewsBlur received a major redesign in May. Last week Betaworks released a beta version of its alternative Digg Reader. Even the once-almighty America Online now has a reader product.